This article (click here) outlines my reasons for "hating" democracy. Well, hate is a strong word. I never said I hated democracy--even if it did result in my death. Democracy allowed me the freedom to devote my life to philosophy, so I did benefit from it. 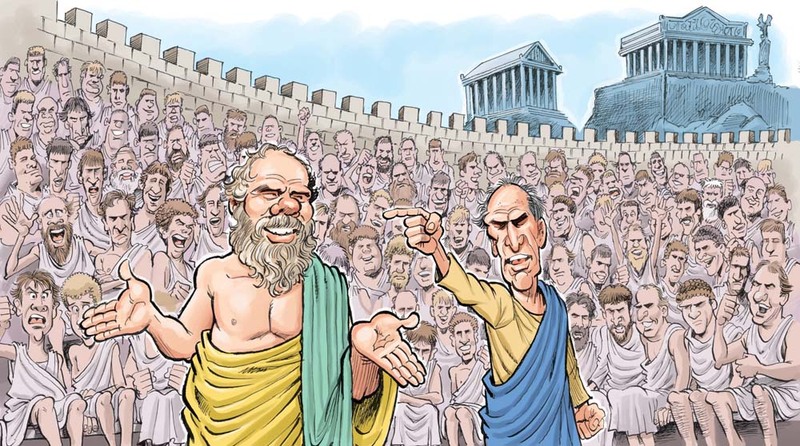 Having said that, I certainly didn't care much for democracy back in Athens, and I still find it problematic. Why? Because it can result in unwise people leading the state. A clever demagogue can very easily convince the public to vote for his or her ideas by appealing to people's prejudices and desires rather than by using reasoned argument. 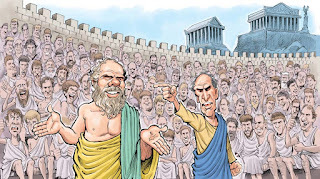 They are like sophists. They make bad arguments look good and good arguments look bad. Their trick of the trade is rhetoric. So, their ideas get voted for (or in modern democracy they get elected to lead) for the wrong reasons. They may not have the wisdom to run the state. That's why I don't care for democracy.